There are so many network devices, that everyone will encounter while your still connected to a network. For example you will find devices like switches, routers, access points, and patch panels more often used to distribute access throughout a vicinity or building. During your journey in the search for network components, you might also encounter older versions of network infrastructure like the hubs, bridges and repeaters. Some of these network components are called legacy devices like the hub, bridges and the repeaters. So then let’s look at these components, which are the infrastructure, on which your network is built and their functions one after another. Hub: A hub is often called a multiport repeater, is a network component used in connecting the node in a physical star topology network into logical bus topology. A hub contains multiple ports that you can easily connect devices to. Whenever a transmitting data is sent to the hub port other ports get the information and transmitted it to all other ports as well so that all other nodes receive the data. However, only the specific destination node reads and processes the information in the data whereas other node ignores it. Specifically the two common types of hubs are passive and active. In definition a passive hubs simply means that is has its ports wired together physically. It also connects devices plugged into it without the use of power otherwise acting like a patch panel. While in the other hand, an active hub is a true multiport repeater. It receives incoming data and retransmits it out all ports with a signal boost. But today in the network industry we use switches in the place of hubs. Bridge: A bridge is an older version of a switch. It has the same basic functionality of a switch, but it has fewer ports and is a software based component, rather than this current normal today hardware based switch. Repeaters: A repeater sometimes referred to as a signal extender, is a device that regenerates a signal to improve signal strength over transmission distances. By applying repeaters network you’re exceeding the normal limitation on segment length imposed by various networking technologies. Switches: A switch is a network hardware component that joins multiple computers on the same LAN together. Comparing to a hub switches only forward data information only to the intended destination. This is because they are built with slightly smarter technology than the hub. In the case of availability switches are also more common. They can also be connected to other switches by doing this creating an increase in the number of devices on a LAN without idling one or more system in the network. In term of troubleshooting switch are much easier also because all the ports on a switch have a physical status light indicator. POE: Power over Ethernet POE provides the power you need to power both the internet equipment and the data to remote device over a twisted pair cable in an Ethernet network. With the flexibility of POE you can place your equipment such as switches, IP telephones, wireless access points and cameras any where convenient and impossible t run out of electrical power source. Routers: A router is a networking device that connects multiple networks. Sending traffics from one network to another does not always have to travel between the same routers. Let assume on the internet now the traffic is routed through best available rout or path at that time. Troubleshooting a router is made easy through the indicating lights on the router. Access point: An access point is a networking device that facilitates the communication and provides an enhanced security to wireless devices on a network. It also functions as an extender of WAN to a physical range in some networks. Repeaters and Extenders: These equipments are used frequently with coax media, such like cable Tv, and also deploy in network that use coax cabling. With the structure of today’s networks repeaters are no longer need but they are used in fiber networks. While in wireless network they are used to extend the range of WAP. Modem: this is a device that is used to modulates and demodulates digital signal into an analog form so that is can be sent over a telephone line hence the name MODEM. The equipment is use to connect to the internet in other to send and receive information on your network .it comes in form of a cable modem or a DSL modem, a wireless modem, a voice modem or a radio modem. Patch panels: This is the connection point for drop and patch cables in a network infrastructure. 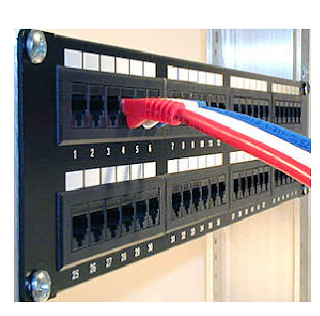 Typically it consist of one or more rows of RJ45 or other connector drop point where the end connection is terminated and up link to the network. Common Network Issues and Solutions. ← Common Network Issues and Solutions.